M12 FUEL™ CPD Percussion Drill. 12 Volt M12 FUEL™ CPD 2-Speed, 3 mode, compact combi hammer drill with POWERSTATE™ brushless motor and REDLINK PLUS™ intelligence. Has a bright LED light for workspace illumination. Max torque: 44Nm, 18 settings. M12 FUEL™ CID Impact Driver. 12 Volt M12 Fuel™ CID Impact Drill with 2 modes: Mode 1 (0-1,200/min, 19Nm torque) ideal for precision work, Mode 2 (0-2,650/min, 135Nm torque) delivers maximum performance for the toughest applications. With LED light and POWERSTATE™ brushless motor. Impacts Per Min: 2,700 / 3,550/min. 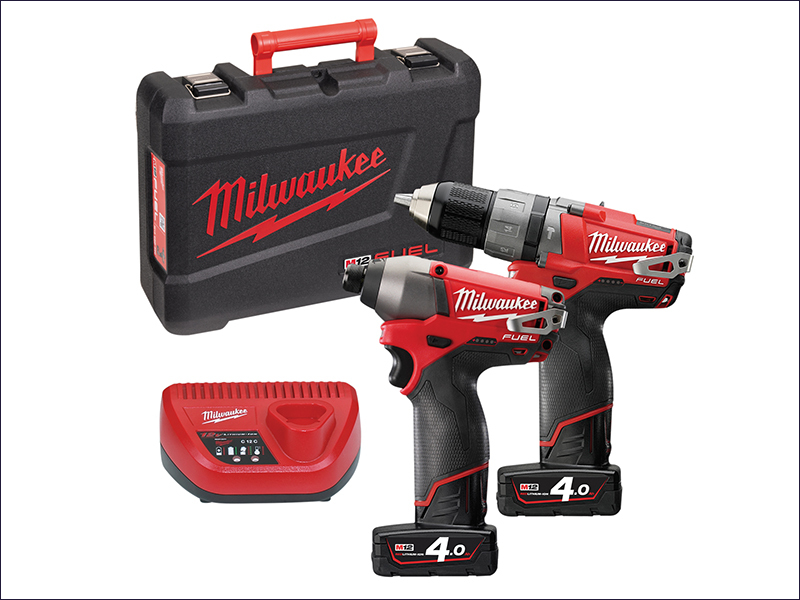 The tools are supplied in a kitbox with 2 x 4.0Ah REDLITHIUM-ION™ Batteries and a C12 Charger.